Honesty – Essential to Pool Table Brand Names? Looking back, what started out as a simple task to buy a pool table turned into a quest almost as daring as Don Quixote chasing windmills. Along the way, something got triggered and the need to hold manufacturers accountable for their claims became an essential element to the brand name’s popularity. It’s amazing how much I learned in those first few weeks of my simple pursuit to purchase a pool table for our family room. 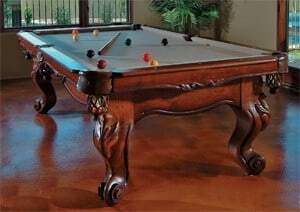 Keep in mind that the reasons that these particular pool table brands landed in the “Trusted” file is exclusively my own personal assessment based on the company’s claims compared to product quality. Likewise, those brands that I placed under “Iffy” demonstrated a willingness to skirt the truth—either with outright misleading statements or the absence of information. This is a stunningly beautiful A.E. Schmidt Pool Table. All of their statements – written as well as those made by their customer service department – turned out to be verified when I went to their manufacturing plant﻿. The lumber in their warehouse is from real trees and there wasn’t one piece of plywood in site! I got to watch the paint department stain and polish the finished pieces. (They use a fine grit sandpaper after the stain is sprayed on for the polishing part.) The billiard cover I chose is a very fine woven felted wool that is so soft and luxurious that it could be used for clothing. And, the rubber for the cushions was real rubber rather than a blended chemical product that looks like rubber. 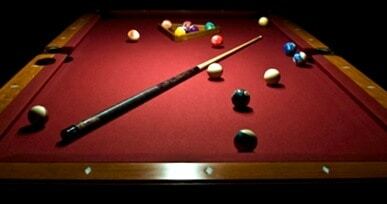 In the photo is a Connelly Pool Table. On equal footing with A.E. Schmidt is Connelly pool tables. The wood is real, solid American hardwoods such as maple but the selection of woods is more limited than that of Schmidt which is the only reason that I put them as second in line. However, their pool table cabinets as well as the crossbeams are all constructed with 2” pre-milled solid hardwood while Schmidt uses the 1.34” thickness. Connelly uses snooker cushions imported from the U.K. made by Aerospace and Schmidt uses Cobra cushions. Both are equally as good according to the professional billiard players. I didn’t personally have an opportunity to go to the plant in Texas but I do have friends that went for me and reported back that they make their tables from scratch, just like Schmidt. 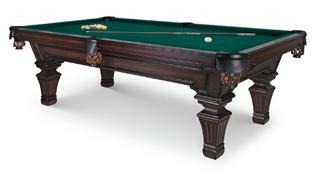 This Olhausen Pool Table is looking wonderful in its wood finish. They are a definite 3rd place in the Trust department﻿﻿ mainly because their advertising claims that they are “the Best in Billiards”. Actually, they don’t hold a candle to the first two in my list. The way in which the table is assembled – metal brackets and hardware and the felt produced by their own brand which is a woolen felt instead of a woven woolen felt – is acceptable but not up to the quality of either of previous two. 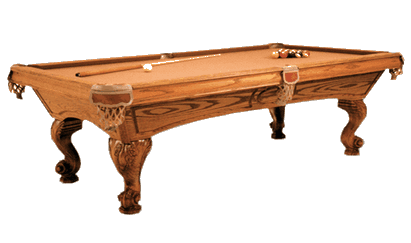 The GW Pool table made from “Heritage Maple” an engineered type of wood. G.W. claims to use solid ﻿“﻿﻿﻿Heritage M﻿﻿﻿aple” wood for their cabinets, legs and rails. The problem is “Heritage Maple” is an engineered wood – a chemically produced imitation wood similar to imitation wood flooring. They do have a manufacturing center in Portland, Oregon who make their product. The quality is acceptable but lacks long-term stability because of the inferior products used to lower costs. 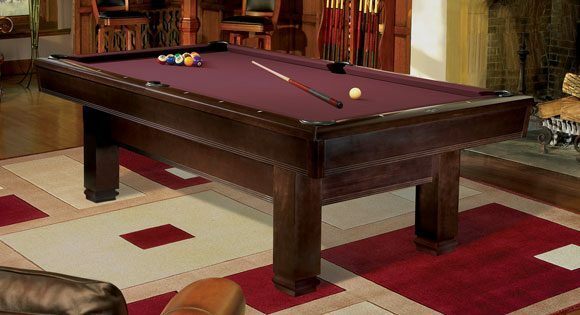 This Brunswick Pool Table is a midnight dream in dark wood and wine colored felt. While it might be one of the best known brand names in the world, it is now producing some of the cheapest made tables in the industry. Particle board, MDF and solid wood parts from Asian softwood trees make up the frame, cabinet and rails. The cushions are chemically created with artificial rubber and the table uses cheap metal from China for its bolts, screws and washers – all of which break. 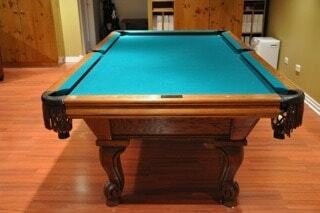 Shown in the picture is an AMF Playmaster 8' Pool Table. Claiming that their pool tables are “Made in America” landed them in the Iffy file because while they are put together in the Ozarks, they are not “made” there. All the pieces of all AMF tables are now manufactured in China and imported to the assemblers in the U.S. The slate used is a cheap grade from Asia and the felt is inferior. There are no customizable options for higher quality materials such as Simonis felt or Aerospace cushions. 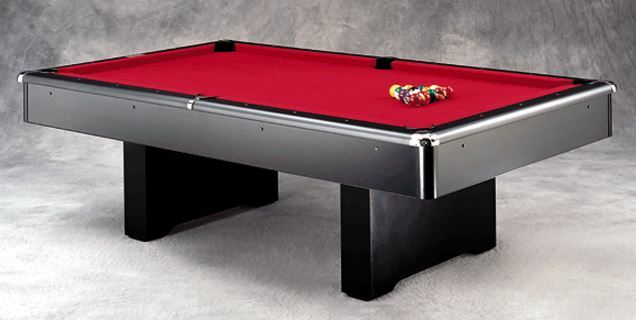 Good pool tables cost between $3,000 and $8,000 and cheaply made pool tables can cost the same thing. The only thing that you can depend on is the honesty of the Brand and if they fudge the truth – can you trust anything else?